Eric Kostecky’s thirst for researching clean water dates back to the beginning of this decade, prior to starting and then earning a Geography degree from Owens Community College in 2017. The University of Toledo transfer student was in the process of moving from Toledo to Milwaukee in 2010 when a neighbor mentioned that he shouldn’t drink the water there. After settling in the Wisconsin city, Kostecky asked coworkers about it and discovered his former neighbor was thinking about Milwaukee’s Cryptosporidium outbreak in the drinking water, a national news event from the early 1990s that had long since been cleaned up. By 2014, Kostecky had relocated to Pittsburgh and watched the national news report about the Toledo water crisis that left more than 400,000 people without drinking water for four days. Chemical tests confirmed unsafe levels of algal toxin Microcystin in Toledo’s drinking water. “I thought to myself, what will people be saying about Toledo’s water in 10 or 20 years,” he said. Back in Toledo, he purchased a half dozen water quality books and immersed himself in the subject. At Owens, he fell in love with geography in Professor Scott Deaner’s classes. A member of the Owens Honors Program, his projects centered on clean water topics. The Whitmer High School graduate transferred all of his Owens credits to UT starting Spring Semester 2018. He is majoring in Geography and Urban Planning with a concentration in Geographic Information Systems. He plans to graduate in Summer Semester 2019. Owens works with transfer students to help them meet their goals, bringing 4-year university advisors to campus to help students with academic planning. Two of the most popular transfer programs at Owens are the Rocket Express and Falcon Express dual enrollment programs. Kostecky, 37, said he was pleased with his Owens-to-UT transfer, and also mentioned that Deaner introduced him to his future UT professors, Dr. Daniel Hammel and Dr. Patrick Lawrence. Through their guidance, Kostecky said he applied and received a grant from Toledo’s Undergraduate Research Office for the study of harmful algal blooms in Lake Erie. According to the University of Toledo website, 50 undergraduate students received research funding, which equates to less than 1 percent of student body, placing Kostecky in select company. 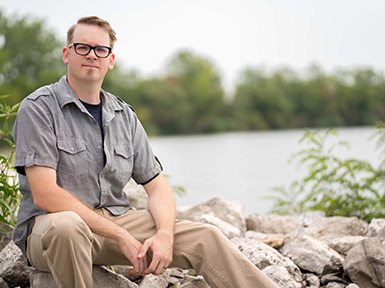 Kostecky focused his research on policies and resolutions, comparing the ongoing cleanup of the Chesapeake Bay, an estuary in the Mid-Atlantic region, and the Western Lake Erie Basin. His extensive investigation this summer included interviewing more than a dozen experts and observing a water sample collection with a research team from UT’s Lake Erie Center on the lake. “It was great to get that different view for trying to solve a problem,” he said. His future ambitions include earning a master’s degree at Toledo and finding a job locally in the clean water field. In October, he’s scheduled to present at the East Lakes Division of the American Association of Geographers Annual Meeting at Ohio Northern University.